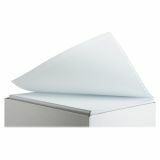 Sparco Continuous Green Bar Computer Paper - Continuous-form computer paper is designed for high performance. 1/6 green-bar format allows easy reading and locating rows of numbers across pages. 20 lb. paper is perforated between each sheet. One-part computer paper is ideal for computerized reports, forms and letters."